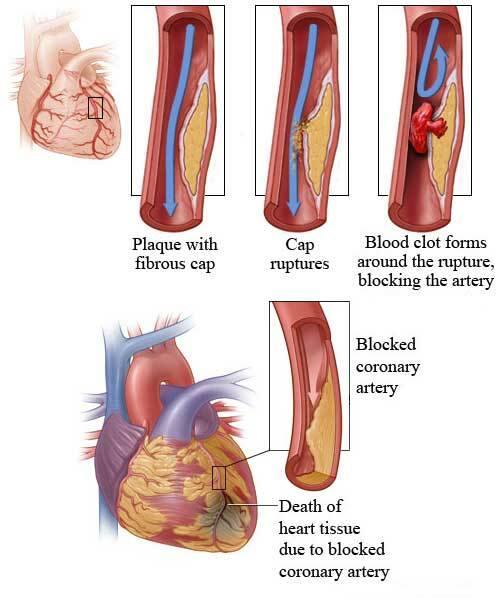 Atherosclerosis is a disease of large and medium sized muscular and elastic arteries. It is slowly progressive disease that begins in childhood and becomes manifested late in life. Basic lesions in atherosclerosis are atheromas that weaken the media and predispose the area to thrombus formation. Though early lesions of atherosclerosis appear in childhood, disease is rare before 30 years of age and usually affects older people. Estrogens have some protective effect therefore, women are less commonly affected by disease before menopause, incidence in females increase after menopause and becomes equal to males after the age of 75. A genetic predisposition for other risk factors, for example, hypertension, diabetes can induce an increase prevalence for atherosclerosis. Inherited disorders of lipoprotiens metabolism also increase the risk of atherosclerosis. Fatty diet and reduce exercise may increase the bad cholesterol levels in the blood which predispose to the development of atherosclerosis. Bad cholesterol circulates in the form of LDL (low density lipoprotiens). Higher the level of LDL in blood greater are the chances of getting atherosclerosis. On the other hand HDLs (high density lipoprotiens) have protective effect. Higher the level of HDL in blood lesser are the chance of getting atherosclerosis. Diastolic Hypertension is more dangerous. Smokers are at high risk. One pack/day produces three fold increased risk for atheroseclerosis. Diabetes induces hypercholestrolemia. There is 100 fold increased risk for atheroseclerosis and induced gangrene of lower limbs in diabetic patients than non-diabetics. 1. Plaques undergo calcification giving rise to pipe stem arteries. 4. Due to atrophy of underlying media (the middle layer of blood vessels), there may aneurysmal dilation. There may be rupture and lead to its serious consequences. Angina can be provoked with exertion . This may show the objective extent of coronary artery involvement. 5. Measurement of velocity with Doppler probe.